Because there's a new PR in town! This isn't the greatest picture - Scott wasn't at a good angle for getting photos, as the finish line area was pretty crowded - but see that smile? That is the smile of someone who just crossed the finish line of the Mews Tavern Bear and Gear 5K in a PR-shattering 24 minutes and 46 seconds. TWO MINUTES faster than my 4-year-old PR. TWO MINUTES faster!!!!!! And what makes this little victory that much sweeter is the knowledge that I accomplished this on what is, hands-down, the toughest 5K course I've ever run on. Not that I've run that many 5Ks, but all the ones I've ever run have been at least relatively flat. Well, let me tell you, there was nothing flat about this race. That is one hell of a way to start and finish a race! The weather was great today - in the 40s, and partly sunny. Chilly waiting around at the start, but very comfortable for running. And I made a point of parking far away from the start so that I could get in a quick warmup jog on the way to the start line. And since I had picked up my number yesterday, I didn't have to get there too early, so I didn't have to spend too much time waiting in the cold. There was a fantastic turnout this year, with nearly 800 runners completing the race. That made for a very crowded and very slow start. I lined up fairly close to the front of the pack, though, so it didn't take me too long to find a clear spot to run in. And since the first 1/4 mile of the race was up two pretty steep hills, I wouldn't have been off to a super fast start anyway, so it all worked out ok. I do prefer smaller races, though - I don't like all that jostling for position. Once I got past the first two hills, it took me another 1/4 mile to feel like I was settling into a good rhythm and pace. I usually don't need a warmup like that when I run, but I think the crowded start and the fact that I hadn't run all week combined to make me feel a bit 'off' for that first half mile. But once I got past that, and we had some nice flats to run on, things started feeling much better. Mile 1 came in at 7:37. I initially thought - yikes, that's way too fast; I better take it down a notch. But then I quickly followed that thought with - no way am I taking it down a notch. I'm out to get a PR, and I only have to run two more miles, and I know I have it in me. So I kept at it, and was able to maintain a pace of 7:31 for Mile 2. At that point, I was pretty certain that the PR was a definite, as it would have taken a near-catastrophe for me to run 1.1 miles in more than 11 minutes. Now it was just a question of how much time I'd be able to shave off the old PR. I was plugging along just fine for most of Mile 3, but then came the monster hill at Mile 2.8. I had thought that it wouldn't be too bad, because I ran up this very same hill last weekend during my 6-miler, and it was tough, but it didn't crush me. But today, it crushed me. For the first time, I honestly felt like I was going to have to stop and walk during a 5K race - something I've never done before. But then again, I've never run a 5K race at a sub-8-minute-mile pace before, either. I really had a moment where I felt like I was just not going to make it up that hill, but then before I knew it, I was almost at the top, and I knew that from the top of that hill, it was all downhill to the finish, and I pulled myself together and rounded the corner to the lovely sight of that downhill stretch. The hill cost me some time, for sure - Mile 3 was a much slower 8:22 pace - but I was clearly still well within PR territory, and when I spotted the clock at the finish line and saw that not only was I going to PR, but that I could actually come in UNDER 25 minutes, I ran for all I was worth, and crossed the finish line at 24:46. Never before have I thrown my arms up in the air as I finished a race, but I did today, and it felt great! It was a fantastic day for running, and a fantastic race. The only thing that really bums me out is that Scott wasn't able to run. He'd been running on the track and on trails all summer, and his shins had been feeling great. But he knew he had to do some road running to prepare for the race, so in the past two weeks he's been trying to do part of his runs on the road, and as soon as he ran more than 5 minutes on pavement, his shins were screaming. He's very discouraged, and so am I. I don't want to see him give up on running altogether, and I don't think he will, but I know it was really disappointing for him to not be able to do this race. The official results are posted, and my time is listed at 24:53, but that was the time they recorded as I was going through the chute. I know that when I crossed that finish line, both my Garmin and the clock read 24:46, so that's my story, and I'm sticking with it. But, according to the official results, I placed 215th out of 796 runners, and 23rd out of 135 in my age group. HOLY COW GIRL!!!!!!!!!!!!!!!!!!!!!!!!!!! CONGRATS!!!!!!! That is fantastic!!!! Hey! Nice job on that PR. That is AWESOME! For the record, I NEVER run an entier race :-) Well, I did run "one" 5K the entire way! LOL. But you did fantastic, and definitely ready to move to the front of the pack!! Awesome Race!!!! You blew away your old PR..WTG! You just missed Mr Splashy. He showed up just as I got in the pool today...lol. Still dont know about running on the beach. 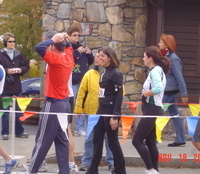 There are pics available from the race. But I didn't see either of us, except for one of the start pics where you kicked it into high gear and started passing everyone!